Christmas is almost here again! 2011 has just flown by! October and November are always great months at Catchoftheday because sales for Christmas really go through the roof, and this month was the perfect example of that with our past sales records broken no less than 3 times over the last 30 days. Last week’s $10 day was literally our biggest day ever; it managed to just beat our amazing Toy Sale which came a very close second. 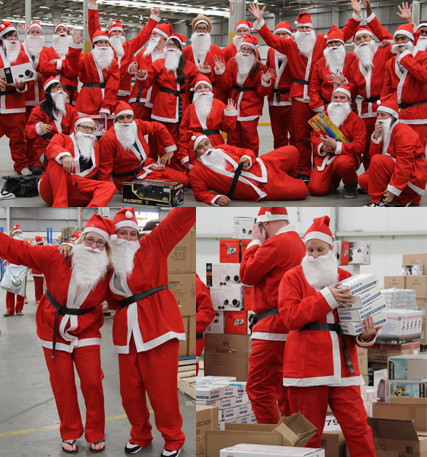 Our Santas are definitely working hard in the warehouse to try and get the orders out as fast as they can! But sales aren’t the only things climbing around here – we’ve had heaps of new members joining every day; our massive Birthday Sale bringing in 25,000 new customers alone! It’s also great to see a lot of you befriending us and following the daily activities on our Facebook page. Our community regularly receives special offers along with daily activities and giveaways, so it’s always a good thing to be a part of. In other news, our latest family member, Grocery Run, is doing just as well as we expected. We’ve had plenty of demand from customers asking for it to go from a once weekly sale to a site that’s open 7 days a week, and just this Monday we launched the new daily Grocery Run! Make sure you keep an eye on the regular events and surprises! Enjoy the shopping, we’ve got some ripper deals lined up! Previous Previous post: You’ve DECIDED! Top 6 Deals Chosen by YOU! Next Next post: COMING UP NEXT WEEK ON CATCH!